Do you love Industrial Chic pieces? Old chippy metal chairs, tables with legs made from pipes, etc.? I have been finding it hard to resist little metal treasures lately. not sure yet where they will go- I just know I love them. totally not my usual style but I am drawn to that crusty metal look it seems. 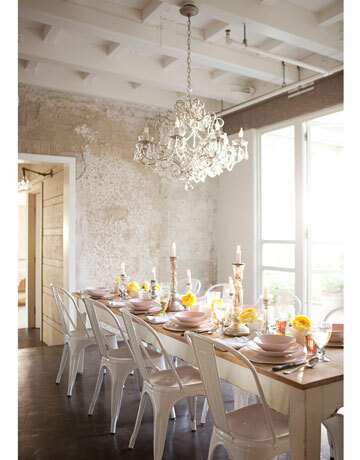 I love a bit of industrial mixed in with more elegant. It just fits my design style I guess- though I don't have too much industrial going on yet. He had this old painted metal stool in his wood workshop off the garage for as long as I can remember. I love the crusty finish and most of all the memories that it has. but love the cracked leather seat as well. and first day of SENIOR year for my middle guy today! and is a welcome break from the 100 degree weather! Now, that green stool looks wonderful in your home, and the best part about it, is it's a FAMILY piece. Old locker baskets are really fun to decorate with, lookng forward to seeing what you do with yours. See ya tomorrow at the partay!! Beautiful post! 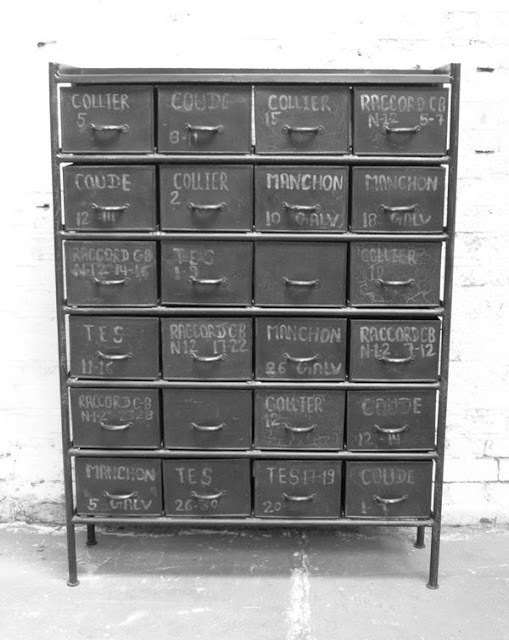 I absolutely LOVE little metal drawers as well...I'm drooling over those gorgeous black drawers. Congratulations on the first day of school; this seems so early! I'm a speech therapist at a suburban school district, and we go back in two (very short) weeks. Yea for fall! Luv some chippy metal. :-) My sun room dining set id black and chippy metal. Redid it once and now decided to let it be... I am weak when it comes to aluminum pieces, sigh... Not sure how I feel about some of the bigger industrial bits yet though. Still thinking about that. Luv your granddad's stool... Mine also had a tall chippy stool he used. 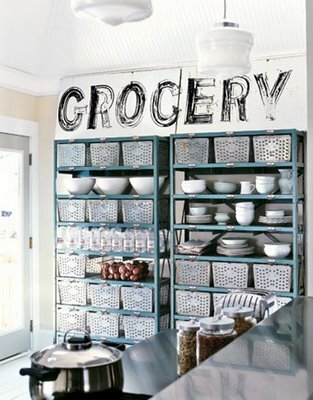 I love added a bit of industrial to my home too! Great inspirational photos.Your kitchen is beautiful! LOVE your Grandfathers old green stool.That burlap adds a nice touch too! I love your stool, how nice that it was in the family and you have fond memories of it. I think you can find a lot of industrial pieces at barn sales and such. I, too, love the look mixed with a little formal and feminine style...it balances out somehow. LOVE your kitchen! Great pictures I love all the chandeliers. The picture from design gallery is just gorgeous. 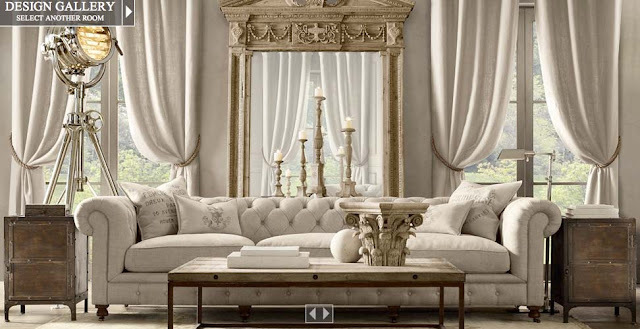 I like the chunky molding behind that great tuffted sofa. I do love metal--galvanized, rusty, crusty. Been collecting it for years. . . Always loved this look. 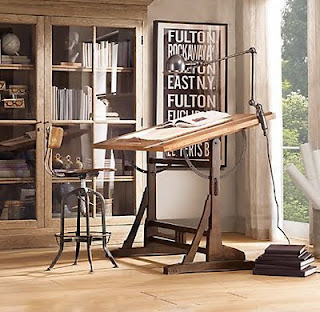 Especially that drawing table. Thanks for sharing. I would love to find old metal lockers for my mud room! I have an old metal cabinet with lots of drawers that I use to organize my craft supplies. 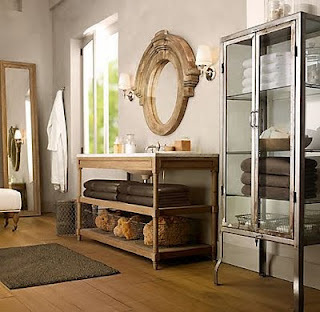 I have always loved the industrial rustic look. I think because it adds so much age to the pieces and there's always a story behind them. I love your grandfather's stool too! Nice touch, that old stool! I do love a mix of industrial with other styles. Great stool. 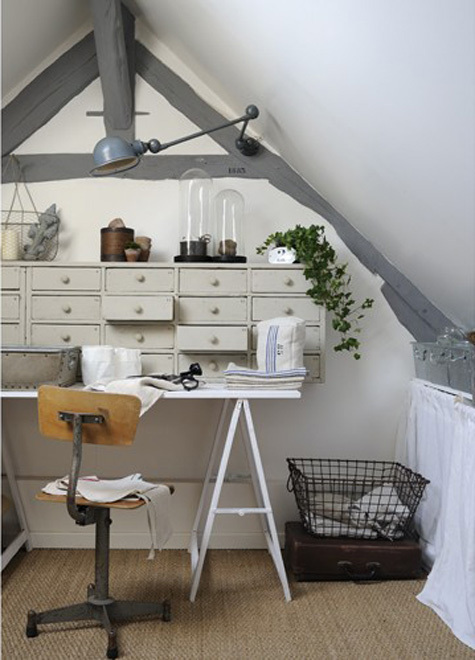 I love the stool, but for the most part I can't get into the industrial look. Too hard for me. I like wood, wood and more wood. I do like to admire it in others homes though. Thanks for a great blog. I love a good mix of industrial chic with my French loves. Great shares! Good luck for your kids, wow, both ends of the spectrum for High School! Industrial is so my thing. I love it... especially if it is a little beat up! Just a few days ago I found the front of an old mailbox. I just had to take the piece of junk home. Not sure what I will do with it... photo prop maybe? It is metal and has a cool beat up industrial look. And it says US Mail even the better. I hope to find soon an idea of what to do with it. Love a little industrial, too! Nothing like something galvanized sitting with something crystal! Courtney, I too have been drawn to industrial from cottage...so much so that I've gone into business...check it out at www.BarnLoft.blogspot.com. Oh the drama of the white sofa room, it is perfection! I love a touch of industrial! I'm hard put to not drag home everything metal and cute! Love the mix of textures... it keeps thing interesting. I think that is why I like a little chippy and rusty thrown in!! The sofa in that photo is stunning... I am having a serious SOFA CRUSH now. You know, i kinda do like it in the mix with the pretty Frenchy stuff. It seems to keep things from being too sweet. And, once again, i love love your kitchen! all we see are beautiful in your blog, thanks to you I have some good ideas for decorating my house. I can't resist the metal either! 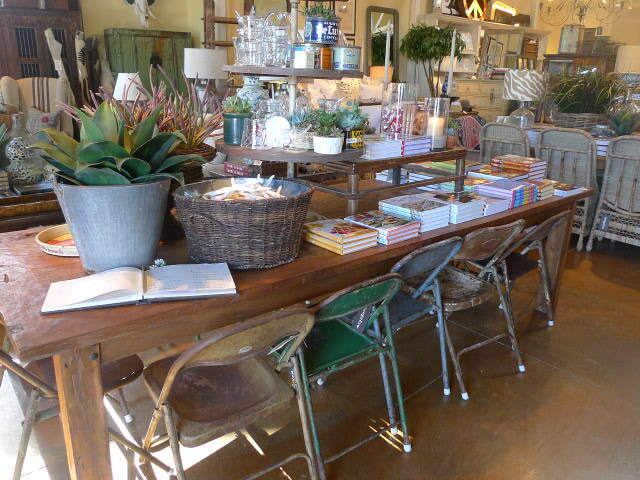 I have an old stool like that in my garage that I need to bring inside!! Just where to put it!! Such lovely inspirations!! Thanks!!! Love the metal! The are so versatile and classic!